Whilst Sennheiser have always made great sounding headphones what they have lacked in recent years is that sparkle in the realm of design in which to compete with the competitions more style orientated brands. Enter the Sennheiser Momentum Headphones with the intention of changing that. Classy and high quality is what its all about here with the packaging giving you that feeling that you are about to experience something high end and very special. Beautiful graphics on the outside with a solid construction on the box you open up to find them sitting in a lovely hard case. Superb quality. The carrying gorgeous and very solid and should inspire great confidence in lugging them around especially on commuting and through airports etc. It Sennheiser, what else did you expect on build quality? Everything feels robust, well put together and extremely classy. The leather headband is lovely to the touch and looks great and the rest is really just an extension. The headphones look like they would last forever due to a solid use of great materials and high standard quality control. The thing that makes the momentum stand out so well is that they look like real class, the don't shout or make a fuss they just look like they belong to a higher end consumer. Certainly they do not even look out of place when worn with a suit and tie and not many headphones can say that. 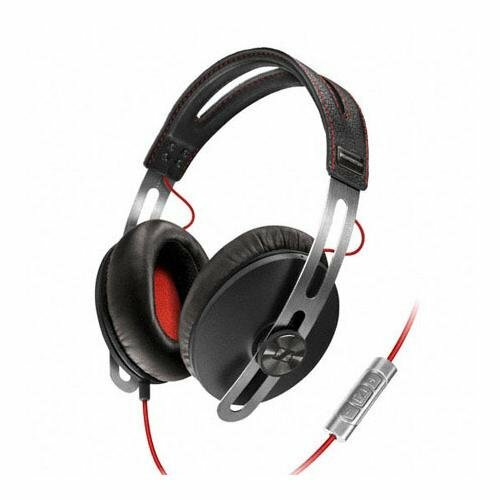 Closed back design and good quality pads combined with sufficient clamping force means that the headphones isolate rather well and should do well for commuting or air travel. A relatively balanced headphone with a ever so slight emphasis on the low end makes the Momentum a thoroughly enjoyable headphone to live with. Bass is fast and punchy with good depth. It doesn't quite extend right down so might not suit mega bass heads but it is a very good detailed and controlled bass that something like the monster DNA can only hope to achieve. Mids are excellent and sound very realistic on string instruments and vocals alike. More so on female vocals however and I did find them lacking slightly in male vocals to the cheaper Zoro's. Still there is just enough warmth there to engage you whilst still allowing you the freedom to pick apart and analyse a track if you so wish. The highs are again excellent and refined, sparkly without heading into sibilance. If there was one criticism I would have on the Momentums it would be that they produced a very slight closed in feeling. The are not as open sounding as some of its competitors. Sennheiser really have stepped up the game with the momentum series. They are just an all around classy set with a great balance of build quality, looks and sound. Where there are better in individual areas I think you would be hard pressed to find one an on ear that combines all three so well in such a portable package.